Following the festival of Diwali 2018 comes Indian New Year 2018 in Vedic astrology or Jyotish. This is Vikram Samvat 2075. According to mypanchang.com, Indian new year 2018 falls on November 8 worldwide, with the exception of Hawaii, where it is the previous day. This is the Gujarati and Marwadi New Year, as different regions of India will celebrate the new year at varying times. 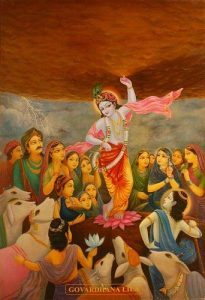 Govardhan Puja or Annakut is performed on this day in certain parts of the world. This year, Govardhan Puja is done on the same day as Indian New Year everywhere except North and South America. They celebrate on November 7. The West Indies, India, and the rest of the world will have an Annakut Festival on November 8. Krishna temples are renowned for their celebrations of Govardhan Puja. This festival commemorates Shri Krishna’s victory over Lord Indra. Indra was using his thunderbolt (vajra) excessively to display his power and thus endangering many lives by creating a great deal of rain. 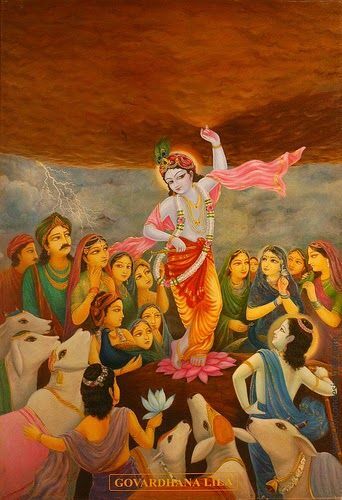 To save the lives of people, Krishna used one finger to lift Govardhan Mountain, which created the rain. Krishna told his devotees to worship Govardhan Mountain so that they could honor nature. Indian temples create a mountain of grains or food for Govardhan puja. A special chant for this day is the Krishna arati. Traditionally, Indians celebrate new year’s day by adorning new attire and going to their local temple first thing in the morning. They commence the year on a reverential note and pray for blessings for the coming year. Devotees offer flowers and sweets (mithai) to the temple. The first money they spend in the new year is an offering to a temple or some charity. Thus, they begin the year with an act of generosity. Indian New Year 2018 is the day when people lay their troubles of the past year to rest and begin anew. The new year is called “Bestu Varas”in Gujarati. People apply fresh coats of paints to their walls. Merchants close their accounting ledgers and begin a new fiscal year. Business owners perform puja to their ledgers, so that Lakshmi may bless them for the coming year. 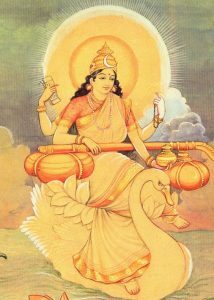 Students worship Saraswati, the goddess of speech, learning, and wisdom. Students also do puja to their school books and notebooks. The books are placed on a table or stool. Books are a symbol of sacred knowledge and consequently they are never placed directly on the floor. Women cook and share sweets with friends and family. Sweets stand for the sweetness in life, which we all savor. Sukhadi (soo-khuh-dee), a sweet made from ghee, mixed with jaggery, and wheat flour is usually cooked and offered for the New Year in Gujarat. They add nuts and cardamom powder to this dish. Finally, a sumptuous feast is prepared for the evening. If you would like to know how to optimize the year ahead both personally and professionally, you may schedule a Vedic astrology reading. Nutan varshabhinandan and saal mubarak to you for Indian New Year 2018! Shubh Bestu Varas! 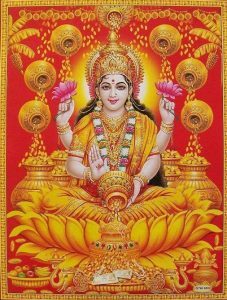 May Lakshmi bless your pocketbook, may Saraswati sit on your lips, and may Krishna give you bhakti to guide your devotional practices.